No country outside the UK can boast a longer history of involvement with Shakespeare than Germany. During Shakespeare’s lifetime companies of English players performed at the courts of German princes, and there were even purpose-built playhouses remarkably like English playhouses some years before the building of the first theatre in London. Many adaptations of Shakespeare’s plays were performed in Germany in the century after Shakespeare lived, and the first translations of Shakespeare’s actual text into another language were German, beginning with Julius Caesar in 1741. During the later years of the eighteenth century Shakespeare worship took off in Germany, as it was doing in the UK and elsewhere. The first complete translation of Shakespeare’s plays into German was published between 1775 and 1782, and adaptations continued to flourish. The German romantic writers Schiller and Goethe were united in their admiration of Shakespeare. Earlier this week Emily Oliver, who has just received her PhD, spoke to the Shakespeare Club in Stratford-upon-Avon about Shakespeare under Socialism, specifically in Eastern Germany from the 1980s until the fall of the Berlin Wall. With huge numbers of people behaving as informers on their fellow-citizens and a Ministry of Culture largely responsible for controlling what was seen, the parallels with Orwell’s novel 1984 were compelling. Oliver gave an outline of the theatrical landscape of East Germany: a country of 16 million which subsidised 68 state-funded theatres. The country has few big cities, so many of the theatres were in far-flung locations. Theatres had their own resident ensembles, and there was a considerable requirement for plays to perform. Not surprisingly Shakespeare was popular, with more performances of his plays than the German writer Goethe. 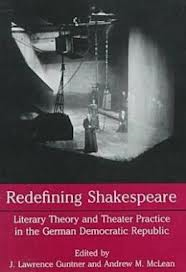 The role of Shakespeare in the socialist German Democratic Republic has been analysed in a number of books such as Steven G Kellman and Andrew M McLean’s 1997 collection Redefining Shakespeare: Redefining Shakespeare: Literary Theory and Theater Practice in the German Democratic Republic. It has been suggested that Shakespeare’s popularity in Eastern Germany was caused by him being a “secret agent”, academic Dennis Kennedy labelling his plays dissident texts. The public became sensitive to ambiguities, reading between the lines of everything that was presented to them. It’s easy to see, in this climate of suspicion, how important Hamlet could be. Hamlet productions, even in the UK, have often been given a setting in which spying is rife, Rosencrantz and Guildenstern being employed as government informers. Oliver concentrated on the production of Hamlet that has become associated with the fall of the Berlin Wall and the end of the East German government. It’s the production pictured on the jacket of Kellman and McLean’s book, entitled Hamlet/Maschine, directed by Heiner Muller and performed at the Deutches Theater in Berlin. It went into rehearsal in August 1989 and received its first performances in March 1990. During this period there were weekly anti-government demonstrations, large numbers of people left the country for Hungary, the Government resigned, the Wall fell and, just days before the first performance free elections were held. In that period of seven months the country had gone through massive permanent changes. The play was set inside a thawing ice cube, an obvious symbol of the developing political climate. The Ghost was Stalin, and Fortinbras a representative of the Deutsche Bank. 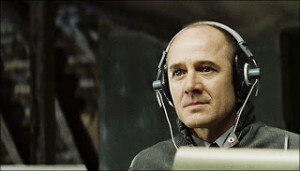 It has become part of the folklore surrounding the production that it actually influenced events, and it is the case that the actor playing Hamlet, Ulrich Muhe, addressed demonstrators while the rehearsals were going on. But although people have liked to say that Shakespeare helped lead to the fall of the Berlin Wall, she suggested this is, sadly, not true. It’s a persistent idea, and Emily Oliver speculated about why this might be. She suggested that it was to do with the ephemeral nature of theatre and memory. With each performance irrecoverable, anything could be claimed by those who had been in the audience. And those audiences consisted of newly-liberated East Germans as well as visitors form the West. In retrospect, people have turned the performance into what they would like it to have been, coming as it did at a critical moment in the history of the continent. Those of us who admire Shakespeare believe that Shakespeare can certainly influence and improve our lives, but starting a revolution is perhaps going a little far. This entry was posted in Legacy, Shakespeare on Stage and tagged Berlin Wall, East Germany, Emily Oliver, German Democratic Republic, Germany, Goethe, Hamlet, Julius Caesar, socialism, Ulrich Muhe. Bookmark the permalink.